MAJOR SOLAR FLARE: August 9th, 2011. This morning at 0805 UT, sunspot 1263 produced a powerful X7-class solar flare. NASA’s Solar Dynamics Observatory captured the explosion’s extreme ultraviolet flash. The solar flare was not Earth directed but a minor proton storm is in progress around our planet, which could affect satellites. Radiation from the flare also briefly disrupted communications on some VLF and HF radio frequencies. A solar wind stream flowing from the indicated coronal hole could reach Earth on or about June 4th. . Credit: SDO/AIA. 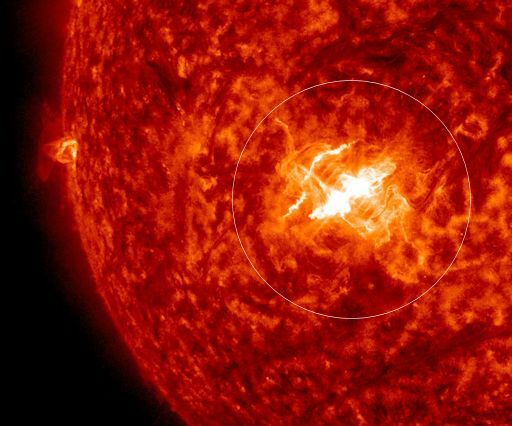 Cape Town – The Space Weather Centre has warned that the sun is undergoing some instability, which has implications for electronic communications. “There is a very active area on the sun as rotated onto the invisible solar disc. This active area has got the potential for more flaring for the next five to six days,” space weather forecaster Kobus Olckers of the Space Weather Warning Centre at the Hermanus Magnetic Observatory told News24. He said that communications and electronic systems might be affected. Sunspots — cooler regions fraught with intense magnetic fields — now regularly dot the surface of the sun, and the star has unleashed several powerful flares in recent months, including a Feb. 14 blast that was the most powerful outburst in more than four years. All signs suggest that the sun has shaken itself out of its slumber, researchers say. After three years in a deep solar sleep of historic proportions, the sun is starting to wake up. In 2008, the sun plunged into its least active state in nearly a century. Sunspots all but vanished, solar flares subsided and the star was eerily quiet. Quiet spells on the sun are nothing new. They come along every 11 years or so, as part of the sun’s natural activity cycle. But this latest solar minimum lasted longer than usual, prompting some researchers to wonder if it would ever end.